In the East, a few enamellers of Lahore in Punjab (at the time under the Persian influence, presently in Pakistan) are welcome by Indian king Man Singh I (1550-1614) in Jaipur in Rajasthan, where they founded the most important production enamel centre in India. Other centres are founded over the two next centuries in Lucknow, Varanasi and finally Delhi (source: Gioielli dall'India dai Moghul al Novecento; see also Lo smalto minakari di Isfahan). During the 15th century, enamel reaches Korea and hence Japan. Both countries call the technique with a word that may be translated as “the seven treasures” (chilbo in Korean, shippō, in Japanese), a reference to the seven precious materials that decorated Buddha’s throne (gold, silver, emerald, coral, agate, crystal and pearl), while the Chinese word for enamel is 搪瓷 (pronounced: Tángcí), literally “porcelain-like coating”. This is a witness of the presence of a shared tradition of Korea and Japan that should be distinguished from the Chinese production. While the Korean tradition is restricted to artisanship and left no important traces in antiquity, the history of Japanese shippō is well documented. It seems that the technique came to the Land of the Rising Sun more than once over several phases and from different countries. The first witness is the enamelled bronze mirror of Emperor Shōmu (724-749), found in his tomb in Nara and presently belonging to the Shōsō-in treasure; unluckily, we don’t have any pictures of this artefact but only sketches, as it belongs to a private collection. Of the same period is the independent witness of a so-called “glass-paint decoration art” in the Taihō civil code, at a time when Japan was under the Chinese influence. Beside these early Japanese examples, the technique seems to disappear in the Land of the Rising Sun until the 16th century, when enamelling returns to Japan from two distinct sources. The first one is Korea, where Dōnin Hirata I learned the enamelling technique; the artist later founded a School after his name, where he specialized in the enamel decoration of the guard of the traditional katana swords used by the samurai. The second source is the important trading market with Europe, known is Japan as the Nanban trading period – a Japanese word meaning “Southern Barbarians” used by the Japanese for the Christian Europeans, in particular the Jesuits from Portugal and the Dutch Protestant naval traders. During this phase, beginning in 1543, an intense trade of artisan products was made possible, including enamelware. This trade was greatly diminished if not even fought against after the 1641 law that forbid Christianity in the country. Despite this, the technique was studied and imitated for a indigenous production of Japanese enamel, whose most important examples are the Kikutei House ornamental sword, the armor of samurai Kobori Totomi-no-Kami, and the curious case of the fusuma, the traditional rectangular sliding panels used in Japanese architecture to redefine walls or as doors, and usually decorated with zen gardens and landscapes (source: James L. Bowes, Notes on Shippo, Londra, 1865). 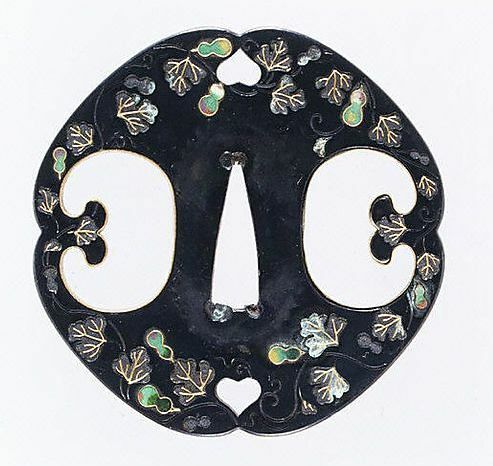 A tsuba (guard for katana sword) produced by the Hirata school (17th - 19th century), decorated with Japanese enamels. Back to the West, the sudden and rapid flourishing of artistic artisanship in Czechia during the 16th and 17th centuries is due to the reign of Rudolph II (1572-1612), who was a collector and created his own “Cabinet of curiosities” to gather the masterpieces of art and crafts that he received as a gift during his official visits. The Cabinet hosted works acquired across Europe. During the reign of Rudolph, Prague welcomed the greatest artists and craftsmen, including many renowned and skilled goldsmiths, who produced jewels not only for the aristocrats, but also for the wealthy citizens. The frequent presence of enamelled jewels in the portraits of the time show how the enamels were probably mistreated, considering the unfortunately low number of objects that have survived to this day. These objects of the period combined several different techniques born in the West, such as ronde bosse, basse taille and champlevé, with an alternation of transparent and opaque colours. One of the most famous enamellists of the period was the Belgian-born goldsmith Jan Vermeyen (Brussel 1559 – Prague 1606). His presence in Prague is documented since 1592. His most important work of this goldsmith is the Crown of King Rudolph, dates 1602, decorated with refined and technically-perfect enamels. Another important name is that of German-born Andreas Osenberg, who authored a decorative chain in the Treasure of Saint Vitus, and the regalia (crown and sceptre) of King Matthias, Rudolph’s brother and immediate successor. The Crown of Rudolph II, made by Belgian goldsmith Jan Vermeyen in 1602. A new technique called “enamel miniature” appeared in Switzerland and France at the beginning of the 17th century. Jean and Henri Toutin from Genève invented the technique in 1632, when they began to apply a transparent enamel on little copper medals and decorated them with color oxides by brush on transparent enamel. One of their disciples, Jean I Petitot, is known as the Raphael of enamel for his perfect works, especially those produced from the sketches of Anton van Dyck using a color palette invented by chemist Turquet de Mayerme. The greatest portraitist was presumably Jean-Etienne Liotard (1702-1789). The Huaud dynasty, also in Geneva, works between the end of the 17th and beginning of the 18th century and will develop miniature also on ivory and parchment. Over the last three decades of the 17th century, this art slowly goes into decadence, both for a change of tastes and for the less accurate quality of the products as they were now mass-produced. 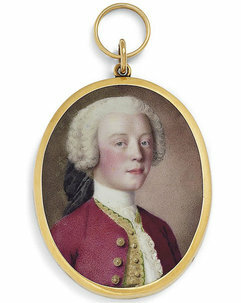 A miniature enamel portrait by Jean-Etienne Liotard. During the Baroque period, at the court of Louis XIV, King of France, the new style Rococo contributes to a new expansion of Geneva-style enamel decoration, characterized by the sensual and light traits and motifs. The greatest enamel portraitist of the period is doubtless Jean-Etienne Liotard (1702-1789), whose school educated many noteworthy artists over the century. During an incognito diplomatic travel across Western Europe in 1697-1698, the new Emperor Peter the Great of Russia got in touch with Western architecture and art and met French-Swedish enamel miniaturist Charles Boit, who was working at the court of William III of England. Fascinated by the technique, Peter tried to import enamelling to Russia, inviting West Europe enamellists at his court in the newly founded Saint Petersburg. The first Russian enamel miniaturist was Grigory Semyonovich Musikiysky from Moscow (1670-1740), who painted the earliest known enamel portraits of the royal family. Another important name is that of Andrey Ovsov, who adopted a stippling (pointillé) style akin to the French and English miniaturists. Finally, in 1763 the Orthodox archbishop of Rostov, Arseniy Tarkovskiy, opened the first atelier to produce enamel miniature icons. The technique, a sort of watercolour-like miniature painting on white enamel, is known worldwide as finift (most probably from late-medieval Greek word “fingitis”, used for shining light gemstones) and is permanently linked to the city of Rostov and its neighbourhood, the so-called Golden Ring, comprising the important goldsmithing centre in Yaroslavl’. 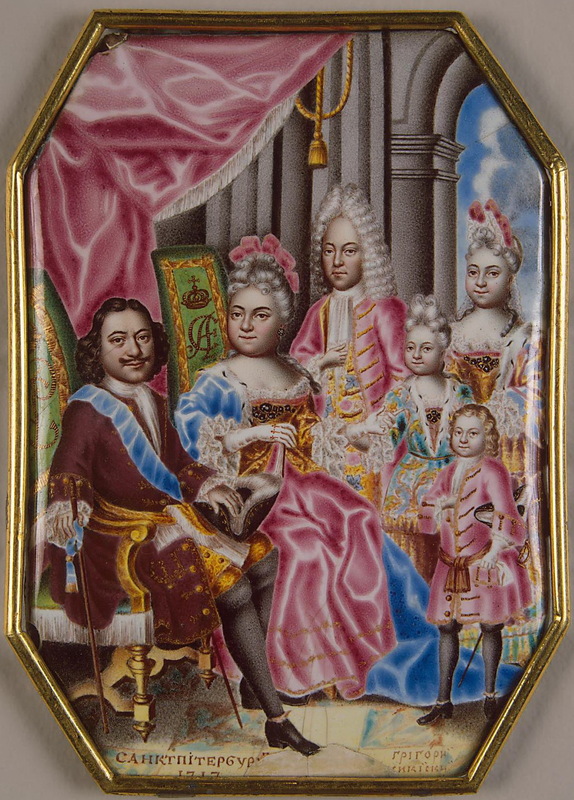 A portrait of Peter the Great and the royal family, enamel-painted by Grigorij Semënovič Musikijskij in Saint Petersburg c. 1716-1717. In England, during the 17th century, a new technique of enamelling application appears. It is called transfer printing, and its main production centre of the time is the York House, founded by Stephen Theodore Janssen in 1753 in Battersea, a district of London. The technique, used for the serial production of semi-industrial luxury objects, consisted of using an engraved copper or steel plate from which a monochrome print on paper is taken which is then transferred by pressing onto the metal piece previously coated with pre-fired white enamel, and then the enamel colours are fired again. The technique met the favour of the Rococo taste and contributed to the development of industrial enamelling and, at the same time, to the partial decline of enamel art. By the end of the 19th century, collectors and archaeologists discover a renewed interest for enamel, favouring the reintroduction of many techniques. In Sèvres, the famous manufacturer of ceramics and porcelain, a new atelier is open from 1845 to 1872, where good executors are educated to the art of enamel. In England, during the last three decades of the 19th century, a new fashion of enamelled medals is revived by expert chisellers working with bronze, silver and, much more rarely, gold. Despite medal enamelling did already exist since the early 19th century, it was only thanks to the work of important medallists such as William Henry Probert (active from 1884 to 1902) and Edwin Steele (continuing over the decades through his son Edwin and his grandson Henry) that the city of Birmingham became an important centre of medal enamelling manufactures, hence they were sold to the best jewelleries of the United Kingdom. A factor that favoured the art of medal enamelling is the new Victorian taste for innovative and unusual jewellery, whose climax in 1887 is known to historians as “the magical year of enamelling”. This is a reference to the celebration of the 50th Jubilee of Queen Victoria, when many memorabilia, mostly enamelled, were created and either sold or distributed. It is impossible to count the approximate number of enamelled medals produced over this period, but we know for sure the contents of the medals: the face of Queen Victoria and the traditional symbolic representation of Britannia, were combined with coats of arms or flower motifs. Another typical subject is St. George and the Dragon, based on the Gold Sovereign coin of 1817, whose original design was drawn by Italian medallist Benedetto Pistrucci (Rome 1783 – Windsor 1855). Another curious example of the fortune of enamel in these years is the creation of enamelled tin bakers for the celebrations of many European monarchs: for example, for the crowning of tsar Nicholas and his consort Alexandra Feodorovna in 1896, the 60th Jubilee of Queen Victoria in 1897, the crowning of Queen Wilhelmina of the Netherlands in 1898 and that of Edward VII of England and his wife Alexandra in 1901. 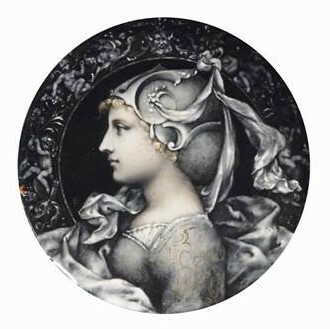 Despite the industrialization of enamelling processes made it more difficult to produce pure enamel art, there were still a few important names connected with this tradition, such as smaltatori Wagner, Froment-Meurice, Falize, Boucheron, Christofle, Tard, Barbedienne, Grandhomme, Garnier, Popelin, Lepec, A. Meyer, and the famous Soyer’s. A noteworthy exception to the decadence of enamel art is Carl Fabergé, a goldsmith of St. Petersburg, who invented the production silver-made luxury enamelled jewellery, where he applied translucent enamel over a guilloche worked surface. His most famous jewellery products are the Fabergé Eggs made of gold or silver, born as matryoshka-style Easter Eggs to contain wonderful and precious surprises. 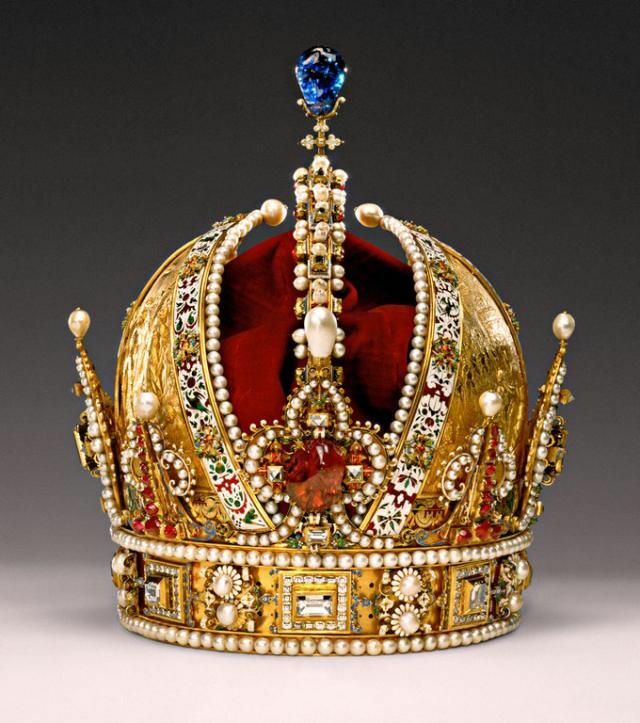 These magnificent objects were born for the Russian tsars and became a true fashion of the time. A great success was also gained by the works of Hermann Ratzersdorfer and Hermann Böhm, silversmiths and enamellists who interpreted the 19th century Neo-classic and Neo-renaissance taste of Vienna during the late Habsburgian Empire, producing luxury objects such as ship-shaped cups and Gothic-style table clocks with ronde-bosse elements or prestigious kitchenware and enamel miniature jewel cases. A representative of Italian Art Nouveau enamel is Vincenzo Miranda, a goldsmith and silversmith from Naples, whose firm presents a gold fibula with enamel decorations and flower motives at the Universal Exposition of 1900. On the left: T. Gobert, Vase with tripod decorated with open-air scenario, 1867/72, National Museum of Ceramics of Sèvres. On the right: Fabergé Egg of the Twelve Monograms, created and donated to Maria Feodorovna for Easter 1895, in memory of tsar Alexander III. Hillwood Museum, Washington D.C., USA.